Drafts from Around the World: Dec 28 2011 - Cairns Australia - so many characters! Dec 28 2011 - Cairns Australia - so many characters! Scenic railroad from Cairns to Kuranda rainforest. Wednesday we took a packaged excursion: 2 hour scenic railroad up a mountain, 3 hours to walk around the town and rainforest of Kuranda, and an hour gondola ride back down. Reading the history of the railroad was probably more interesting than the ride itself. The line was planned and mostly built between 1882-1893 by 700+ men hand-carving 15 tunnels from sea level up to an elevation of 1000 feet. By the time they finished the line, the gold rush had ended and interest in the rail line was gone. Flash forward to 1978, some hippies opened a market at the top of the rail line in the town of Kuranda. They ran the rail line for a couple of seasons, then it was clear there was a lot of demand for the rail line and it was formally reopened. The view from the train was majestic, complete with a waterfall, view of the valley and sea, and a 180 degree hairpin turn where the front and back of the train have a direct view of each other. garden. Who's their decorator, JJ Abrams? After some browsing in the market, we ended up at the Kuranda Coffee shop, which is split into two sides: members only (locals) and tourists. The members look like a cross between bikers and hippies. Very tan, long flowing clothes, leather jackets, long hair, big white beards. I tried to peek inside the members area, it looked like bikers sipping coffee and doing crossword puzzles, but apart from the tourists. The barista was a crazy character. We were asking about where the locals go to hang out. Half his teeth missing, he was teasing us mercilessly: 'Why aren't you staying in Kuranda for several days? Why haven't you hired a car? You need to cancel our arrangements and road trip around Australia! NOW!' He did make a mean macchiato though. So many kangaroos to feed, so little time! We ended up at the Kuranda Koala Gardens, where Olga fed a kangaroo and I cuddled with a koala bear. Here's how it works. Australia has laws limiting how much cuddling each koala bear may be subject to on a daily basis. To make sure everyone can (pay to) cuddle a koala, they have a huge stock of koala bears on hand. To feed sufficient koalas for cuddling, the park owns enough acreage to house many thousands of eucalyptus trees. So according to the park, our purchase of a koala cuddling photo directly resuscitates the koala bear species and habitat. Somehow it seems fishy, but he was fun to hold and the photo is super cute! So much action in the rainforest! Once you start cuddling, it's hard to stop! After you have visited one of the parks (koala, bird, or butterfly), you have enough time to so souvenir shopping or perhaps take a rainforest walk, which is what we did. It's a neat 1.5 Km (paved) walk through a rainforest rich with the sounds of cicadas, crickets, and tropical birds; views of tall trees and ferns; the feeling of a continual mist, and the smells of green freshness after a summer rain. There's also a spot where you can see both the Scenic Railway and the Skyrail gondola, so railroad geeks won't feel left out. The Skyrail gondola ride down is scenic and a fast 45 mins back down to Cairns where you will potentially share a gondola with a family from Texas who didn't have enough time shopping for souvenirs in Kuranda so they came back for a second 3-hour visit. We spent the late afternoon and early evening at Hides Coffee Cafe in Cairns catching up on downtime and online activities. Torsten, the manager/barista was a charismatic eclectic fellow from Hamburg Germany who travels the world seeking to simplify the complicated and complicate the simple. Next he's off to India to study computers and design (and give away) a new level for a for a 1st person shooter video game. 3 more hours to try the bugs!! Great photos, peeps! Missing you stateside. 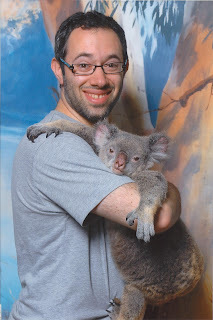 How does it compare to holding Wally, your childhood koala? ;) Are they really in a drunk daze like their reputation? He was a lot like Wally. It seemed he knew exactly what he was doing - dug his claws into my shirt and didn't want to let go! !